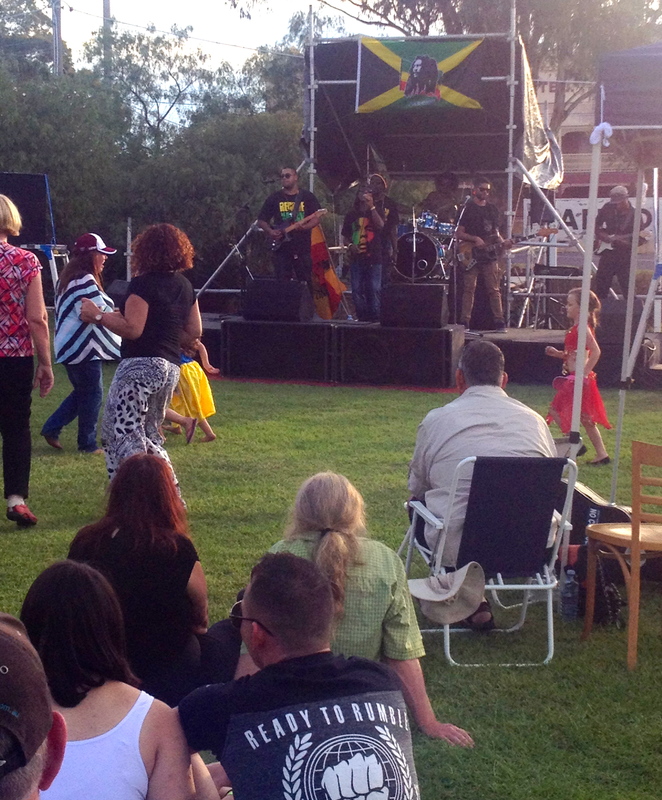 Yesterday was what is now the annual Bob Marley Festival held on the Railway Green at Kandos. This year built on last with a bigger crowd, more varied market stalls including Jamaican food and more reggae bands. It’s a fantastic day out with a long afternoon of live bands and people celebrating reggae music and just getting out and having a lot of fun. For the locals, it’s a vibrant and colourful change and many don Rastafarian beanies and dreads for the day. The headline act is Errol Renaud with his band Caribbean Soul , however I particularly liked Joe Tee and Afrodisia, who stayed after their performance and were dancing with all the locals – especially Big Mama. This year included a Jamaican food stall that was hugely popular with its Jerk Chicken, however my friend and I were encouraged to try the goat curry which was delicious with the rice and beans. It was wonderful to see the locals – from toddlers to great grandparents, dancing to the music. Cowboys mixed with dreadlocked colourful beanies along with other costumes, such as the little girls in their spangly belly dancing costumes. Not to mention the very cute little girl dressed as Snow White. Another fantastic day in Kandos. Well done Sue, Dave and Mary!